We were wrapping up a week of filming in Bend when I was first approached about the idea of riding in northeastern Oregon. My friend Joel told me of the high alpine, high exposure riding and of the stunning views and amazing people who were a part of the Enduro Fondo event hosted by Range Tour and Shuttle Company. Several emails and a few months later, I found myself on Interstate 84, driving from the Boise Airport to the old gold rush town of Baker City. The town of 10,000 is situated at the feet of the Elkhorn Mountains, which make up the westernmost ridges of the Blue Mountain Range. I would spend the week just outside of town with the Thomas family, made up of Pat, Elisha, Ezra and Izabella, who are the proprietors of Range Tour and Shuttle Co. 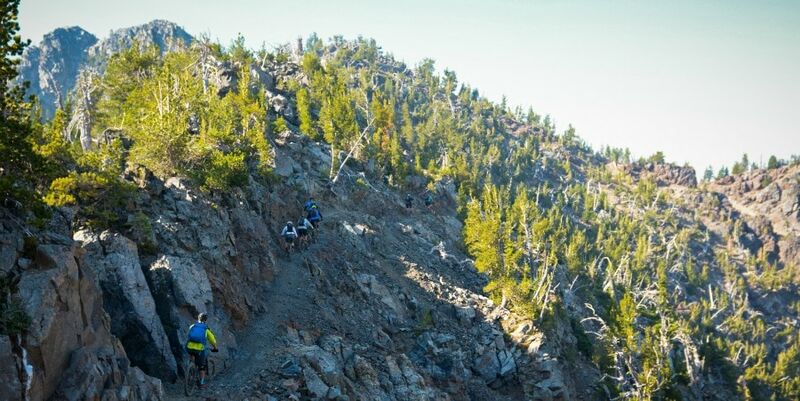 They specialize in providing mountain bikers and hikers with shuttle services in Eastern Oregon, as well as guided tours of an ever increasing array of mountain bike trails. 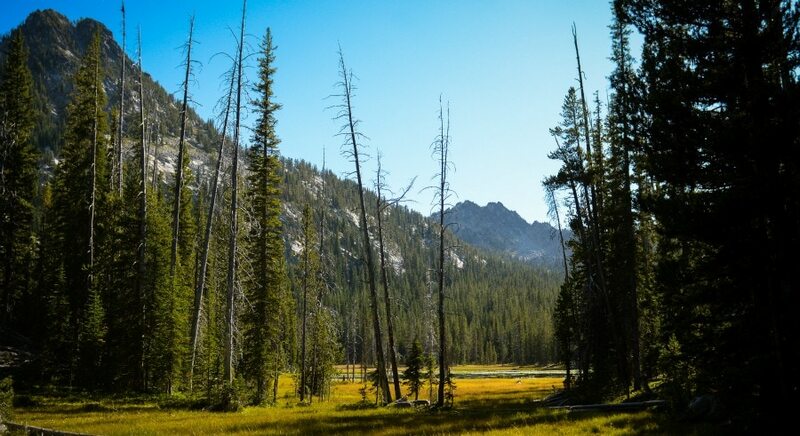 Unfortunately for most of the Pacific Northwest, wildfires had been waging war on the forests and communities of the region, and even for areas not experiencing fires themselves, the smoke from these hazards was working its way across much of the American west. 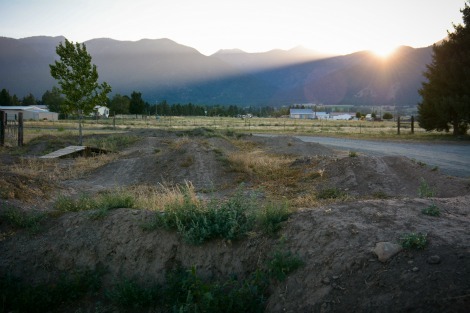 The Elkhorns and Baker City sat squarely in the middle of a number of fires, and as I approached the Patrick residence, the massive wall of mountains loomed like hazy apparitions, directly ahead of me. However, as the sun set on my first night, the smoke began to clear and the golden hour before dusk was like none I’ve ever seen before, with brilliant oranges, reds and yellows bouncing off of the appropriately named Blue Mountains. For the next several days, a shift in the prevailing winds meant that skies were clear. Not only were the Elkhorns in plain and brilliant sight, but the Wallowa mountains stood prominently across the valley to the east. Pat and Elisha treated me to a day exploring M.E.R.A. (Mt. Emily Recreation Area) trails, located on Mt. Emily just outside the neighboring town of La Grande. This would prove to be a great introduction to riding in the area, with loose and dry conditions found throughout the bench cut, purpose built singletrack. The mountain offered some beautiful views of the valley and the Wallowas. Over the next several days, we went up. Way up. 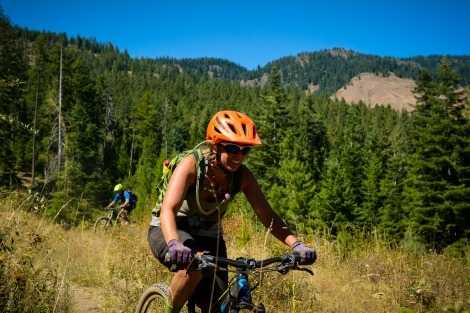 For three days, the Range Tours’ Enduro Fondo showcased trails high up in the Elkhorns. With the state’s highest singletrack, these mountains provided us with everything from exposure, shale, and granite surfaces atop the ridge to roots, chutes and dry loam downslope and underneath the canopy of spruce, hemlock and pine. Mountain goats, eagles, elk and a bevy of other alpine species stared as our group of 15-20 riders weaved up and down the mountains at elevations ranging from 3,000 to almost 9,000 feet. It was riding unlike anything else I’d ever ridden in Oregon, or anywhere else for that matter. I’ve spent time racing and riding throughout the state, in places such as Sandy Ridge, Black Rock, Mt. Hood, King’s Castle, Bend and others, but the Elkhorns were on another scale. The loose shale and high exposure riding took me out of my comfort zone; often times I needed to remind myself to pay attention to what’s ahead of me on the trail and to stop taking in the jaw-dropping views of the surrounding mountains and valleys. Dropping down the mountains meant that we would have the opportunity to break for lunch at high alpine lakes before opening up on some gloriously reliable dirt, as the terrain transitioned from alpine to forest. The rides were long but never dull, and at the end of each day, every single person involved had an ear-to-ear grin on their face. Maybe it has something to do with the population centers (or lack thereof) that exist east of the Cascades; in fact, I would say it almost certainly has some effect, but I can’t believe that I haven’t been reading about the riding here, or staring at photos from this aesthetically stunning part of the country, watching mountain bike heroes blast down these descents. Because, in my own estimation, this “other” Oregon offers up quite possibly the best riding I have ever had the good fortune to experience. 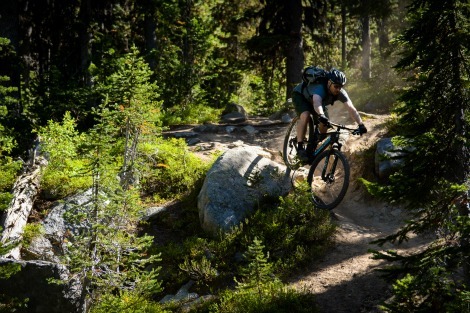 The Pacific Northwest is renowned for its abundance of mountain biking and adventure opportunities, and while the crowds may be flocking to the literally greener pastures west of the Elkhorns, the greatest adventures may very well lay a few hundred miles to the east. It’s certainly a place I think all riders need to see firsthand. I, for one, cannot wait to return. Brice considers himself extremely fortunate to be able to make a living riding bikes and telling stories about his many adventures aboard two wheels. A professional mountain biker who proudly hails from the east coast, he's begun to step away from racing and focus more of his energy on providing narrative and content to anyone who's looking for a bit of inspiration from the trails and mountains. When he's not busy writing, photographing, filming about or riding bikes, he's obsessing over his 4-month old son Logan alongside his beautiful wife Megan and their 11-year old rescue dog, Sammi. Range Tour & Shuttle Co.